In an effort to spread awareness of the dangers of drinking too much soda, health advocates created a powerful music parody of Coca-Cola's iconic "Hilltop" ad from 1971, sang by real people suffering from diabetes and tooth decay. The Center for Science in the Public Interest (CSPI), a North American health advocacy nonprofit group based in Canada, commissioned the Lumenati agency to produce a morbid version of the cheerful soda commercial featuring multicultural teenagers singing "I'd like to buy the world a coke and keep it company." The 1971 commercial gained new cultural relevancy when aired during the Mad Men series finale on AMC this past May. 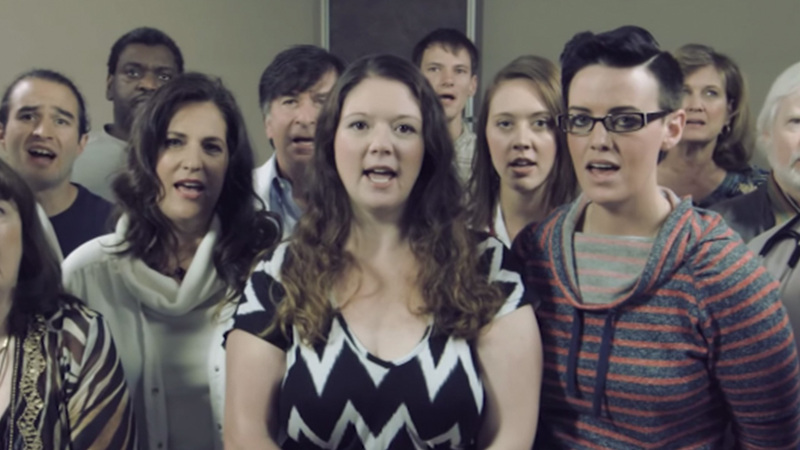 The parody begins with the original, happy lyrics sung by Denver-area residents suffering from ailments caused by high sugar diets such as obesity, Type II diabetes, tooth decay and hypertension. But the lyrics quickly turn dark and cautionary: "I'd like to buy the world a drink that doesn't cause disease." CSPI claims that sugary drinks are the leading source of calories in the American diet, and raise the risk of diabetes, tooth decay, and weight gain. The nonprofit hopes the video will spread awareness of health risks associated with high sugar diets and reduce sugar-related disease. "For the past 45 years, Coca-Cola and other makers of sugar drinks have used the most sophisticated and manipulative advertising techniques to convince children and adults alike that a disease-promoting drink will make them feel warm and fuzzy inside," said CSPI executive director Michael F. Jacobson in a press release. "We thought it was time to change the tune." "Soda is just one of several contributors to diet-related disease, but it's a major one," said Dr. Jeffry Gerber, a Denver-area physician who appeared in the film. "It's hard to ask patients to practice moderation when all of the advertising, marketing, and overall ubiquity of soda rewires people to over-consume sugary drinks." ABC has reached out to Coca-Cola for comment, though has not yet received a response.